Here is a photo of a fruit i grew from seeds originally from Jim West in Ecuador. He sent them to me as Chrysophyllum auratum, but on a later visit to my place told me he wasn't sure if that was correct latin name. It seems it doesn't match description in the Pennington sapotaceae monograph (Flora Neotropica), but then again none of the other species match either. So left this species name for now. 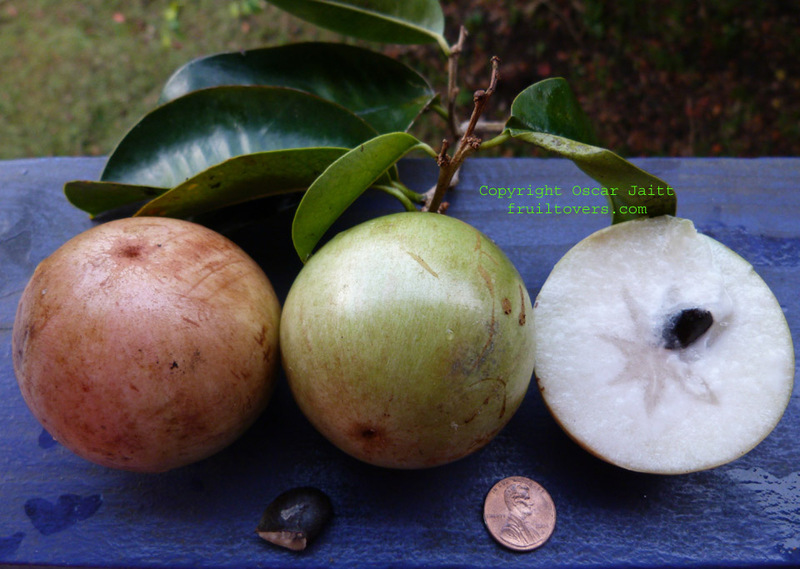 Local name of this species in Venezuela is caimito dulce, sweet starapple. And it is indeed very sweet. The fruits are a bit smaller than starapple. The fully ripe color is light pink, but can be eaten when greenish yellow. The fruits only contain one seed each. The good thing is that the tree produces fruits much earlier than starapple and the season is a lot longer. The tree seems slower growing than starapple though. The tree has an unusual strong musky smell that it radiates, even without brushing up against it. No smell in the fruit. The leaves don't have the velvety bronze color on underside like starapple and are more rounded on tips than starapple. I have a very few seeds if anyone is interested. Thank you so much for the chance to grow these. Oscar, do you know if it can be grafted on caimito? I wonder if this is the same as what's known in Vietnam as Vú Sữa Bơ Hồng, I don't know how to translate that cultivar name. Maybe NEWGEN or DNT can have a crack at it. Google translate is terribly inaccurate for Vietnamese-English. Don't know for sure as i've never tried it, but would guess that it can. I've heard that Chrysophylum species are very easy to inter graft. I would be willing to send scions if anyone want to try it? Your photo looks like green starapple. Mine is a different species. Green starapple does not turn pink when fully ripe and has several seeds inside. Also starapple has long pointed leaves, photo on mine shows small rounded leaves. Just realized that your photo is of the bonsai. Anyway this is not a different cultivar of starapple. It is a different species: different leaves, different flowers, different shaped tree. Never have seen a starapple bonsai here. We have a large japanese population in Hawaii and i go to their bonsai shows. Most common fruit bonsais here are jaboticaba and surinam cherry. 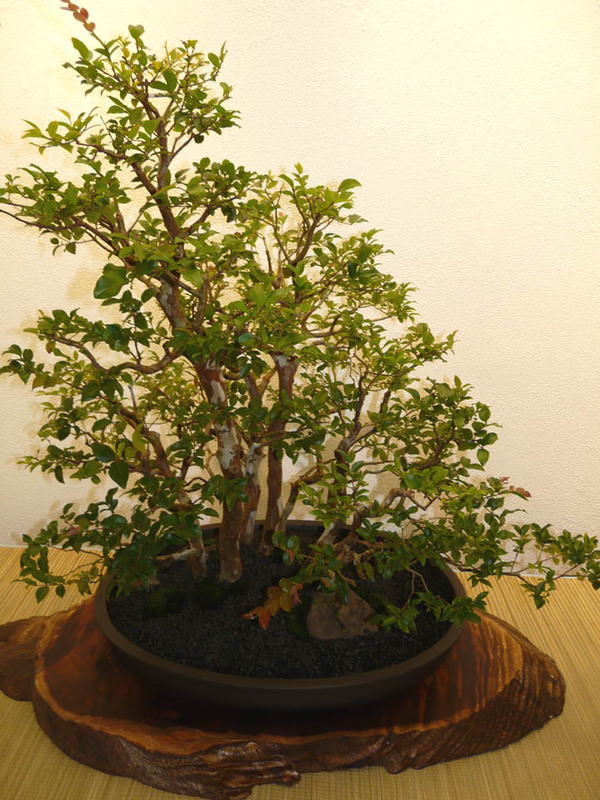 Have you ever seen a jaboticaba bonsai hold fruits? No. The ones i saw were with no fruits or flowers. But that could just be because was wrong time of year. I think the plants i saw had wide enough caliper to hold fruits. I find that all bonsai specimens of M. jaboticaba (sabara, most typical variety cultivated here), they don't flower or hold fruit. The reason is lack of water, due to not enough root mass, and substrate to draw moisture from...bonsai growers don't realize, but this tree could be sat in a deep dish, like an iris, and it would evoke the jaboticaba gods to induce a flowering cycle (i believe). Have seen the hybrid Red, fruit as a bonsai, and I assume this plant could be a high dollar item, and a welcome adornment to any office desk. butter pink breast milk....hahaha yup that's it. Is the pink referring to the juice color or to the exterior? Ok thanks DNT. Do you have any photo available? Very different from plant i have. Does the fruit taste similar to the star apple or is it much different? The texture in the picture you posted also looks more firm and not as soft as the regular star apple. Is that correct? I had someone graft the budwood you sent onto regular star apple. I hope they take. Have you or anyone else tried grafting C. auratum onto the C. cainito? I have seen a variety of starapples that are green or pink or beige that have been grown from seed.Copper,griml,pink,green,giant green and rose staraplles are names I have heard attributed to them and the fruit photo looks like a copper. Yes it tastes similar, taste i find a bit sweeter than regular starapple. Texture is about the same. Have not tried grafting it onto anything. Doubt anybody else has tried it. Doubt anyone else has it or knows even what it is. We're talking about a brand new introduction. Mike this is not a starapple, this is a different species of Chrysophyllum (auratum): leaves are different, more rounded in shape and no bronze underside. Also shape of tree is different and seems smaller. Yes there are different colored starapples, but all of them have bronze underside on the leaves, no matter what color the fruit is. BTW, there are very many different species of Chrysophyllum and many are quite good to eat. We have lots of the ones without the gold/brown/bronze underside to the leaf. They are still called starapples as they are similar in most ways, but are smaller and pinkish green usually, very nice milky flavour. a real favorite of bats. Most people here just call them pink star apple. May not be the same as the one you have, but certainly no color on the leaf underside. Sometimes leaves are pointed. Ok, you might call them all starapple, but if they don't have bronze underside on the leaves they are a different species than starapple (cainito). 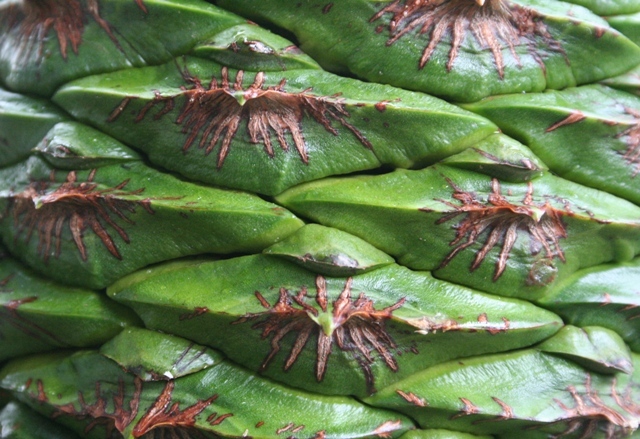 The leaves on this auratum are rounded at the tips and wider than cainito leaves. Also the fruits all have only one seed inside. Usually cainito has 4-8 seeds inside. Fruitlovers is absolutely correct and I would not have called it starapple if I had looked at the foliage in the photo.I have no name for it.Some starapples seem to have less colour than others beneath the leaf but not like that.2 or 3 more seeds and the fruit would have looked almost the same as the copper starapple I spoke of earlier. This species i have is unique also in that the whole tree emits a kind of strong smell, don't know how to describe it except mildly skunky. On the positive side it seems to always be flowering and fruiting. I think that unlike starapple this species might be everbearing. Starapple here only fruits in the spring: March-May. BTW Mike, if you ever find out what other species of Chrysophyllum you have there in Australia i'd be interested to know. Thanks. Fruitlovers I am pretty sure there is only starapples here and no congenors with good fruit although I have only had fruitof the copper one.There must be a good deal of phenotypic plasticity and well as a broad genetic base.The giant purple partial seedless one at the kamerunga resaerch station was brought over by horticultural scientists in the 70's.It was much like a very large flattened haitian with only the occasional seen.I don't know its source or if any prgeny survives.